Ensuring there is an even 50% split of female to male leaders in the Life Sciences industry is the lifetime goal of one of Australia’s few female biotech CEO’s, Samantha Cobb from AdAlta. 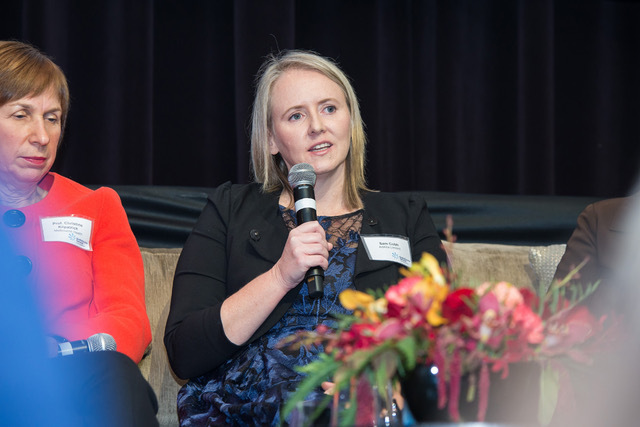 Speaking at the 10th annual BioMelbourne Network “Connecting Women” event, Ms Cobb pointed to a lack of confidence and difficulty re-entering the workforce after children as among the top reasons why women in leadership positions are scarce in the life sciences sector. In a report released in December last year, NDF Research found women made up just 7.5% of CEOs working in life sciences in the US. The sector in Australia and New Zealand fares slightly better, with 13% of its CEOs being female. Ms Cobb is the Managing Director and founding CEO of emerging Australian biotech AdAlta, which is developing a next generation antibody called an ‘i-body’. AdAlta’s lead therapeutic program has received global attention as a compelling potential treatment for lung fibrosis (idiopathic pulmonary fibrosis, or IPF). Under Ms Cobb’s leadership, AdAlta listed on the ASX in 2016 and raised $10m in an oversubscribed IPO. “I haven’t seen many females on either side of the table when it comes to raising capital, especially in the micro-cap space,” Ms Cobb said. Ms Cobb is passionately committed to encouraging women into the emerging life sciences sector and is actively working to readdress the balance of sexes in leadership roles. She is on the executive committee of Springboard Australia, a community-driven accelerator program for high-growth tech companies led by women, from which Ms Cobb herself graduated in 2013. Through Springboard she assists emerging female biotech leaders to better present and market their companies to an investor audience. Ms Cobb has a Bachelor of Science and a Masters of Intellectual Property Law and was working as Business Development Director for the CRC Diagnostics when she was approached to lead AdAlta. As a guest speaker at the BioMelbourne Network Connecting Women Lunch on Friday, Ms Cobb was asked to consider where she was in her career 10 years ago. “I was experiencing one of the most challenging times in my career 10 years ago,” she said. “AdAlta was an unlisted company looking to raise funding in the middle of the Global Financial Crisis. We had a pharma partner walk away, and then shortly after an acquisition fell over. Times were tough, but we raised private venture capital shortly after and progressed the technology to where it is today – an asset going into the clinic.